You may want to create a Release at this point in order to upload your final course to your LMS or simply to share with your colleagues. Choose the orange ‘Add a Release’ button. 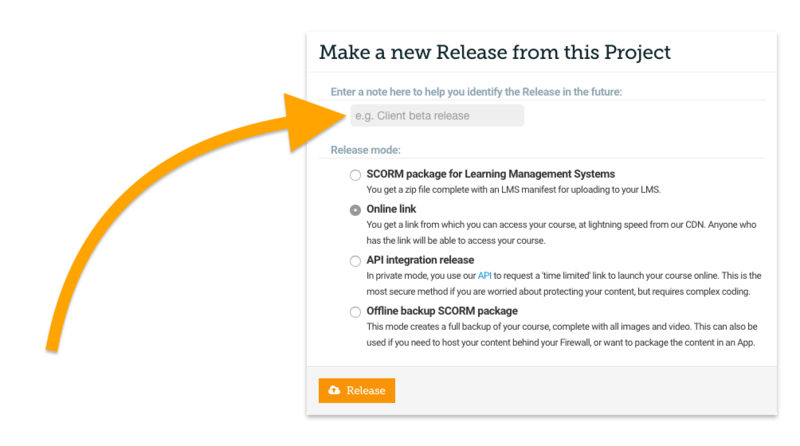 SCORM for Learning Management Systems - This will mean that you receive a Zip file direct to your inbox in five minutes, you will then be able to upload this to your LMS. Online Link - This will make your Project into an online course, you will receive a link to your course and you can share this with anyone you like instantly! Once you’ve made your decision click ‘Release’. Your release will now be built, as soon as it is ready we will send an email.